The decision to start a family is an important one. Learn how to stay healthy and plan for delivery. Learn how your body changes and your baby develops. 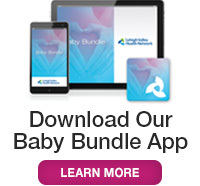 Learn what to expect during labor and delivery. Learn about recovering from childbirth and your newborn care. We offer classes about raising a family, covering childbirth, breastfeeding, parenting and more. Videos from the educational program "A New Beginning" teach about postpartum care for yourself and your newborn. Learn the guidelines for choosing the proper car safety seat and the correct way to install the seat and buckle your child. Additional information is available here. Reduce the risk for Sudden Infant Death Syndrome (SIDS) and other sleep-related causes of infant death. Read articles about keeping your child well, including information about vaccinations and medications. Get tips for avoiding injuries. Now Open! The new pavilion brings obstetrics and newborn services to LVH–Muhlenberg for the first time in the hospital’s 54-year history. The facility can accommodate about 2,000 births per year.